The following is an excerpt from my latest home organizing book Never Too Busy to Cure Clutter. If you buy it between now and February 16, fill out this fancy form, and I will send you a FREE audiobook copy of my first book Unclutter Your Life in One Week. So, if you want to tackle clutter, mess, or grime in any room, this is a good way to start. Choose a task based on how much time you have available and get to work. The following are basic actions you can complete in almost every room of your home. Some of these tasks seem incredibly obvious, but it’s often the simplest and most conspicuous tasks that form the foundation of your cleaning routine. A few of the following tasks are equally important but only need doing at certain times of the year. Pick and choose your way to a clean, uncluttered, and organized home. When working in any room of your home, ask yourself: Where is clutter accumulating? Is there a reason things are piling up in one (or more) area(s)? What would prevent clutter from being left in this space? What small act would greatly improve this room? Dust one of the following: a single shelf, a picture frame or two, the top of a doorjamb, a lamp, or a light fixture. Wipe down a tabletop or other flat surface. Gather wayward pens and pencils and return them to their storage spot. Clean a doorknob with a disinfecting wipe. Replace a burned-out lightbulb (preferable with an LED bulb, so you won’t have to replace it again for years and will save on energy costs). Find two items that aren’t where they belong and return them to where they do. Clean a mirror, window, the glass front on a cabinet, or picture frame. Dust a ceiling light/fan fixture, crown molding, baseboards, or a corner of a room with a telescoping duster. Check your toilet paper and facial tissue inventory throughout the house and replace as necessary. Change your perspective: Lie on the ground or stand on a step stool to see if you can spot hidden clutter. Empty the trash cans and/or recycling bins in a room. Round up dirty clothes to start a load of laundry. Check the batteries in a device. Replace them if necessary. Move a piece of furniture and sweep or vacuum under it, or vacuum al the air vents in a room. Fill a basket with wayward items and return those items to the permanent storage locations. Vacuum or sweep the floor of a room. Fill a bucket with 1/2 cup white vinegar and 1 gallon water, and mop the uncarpeted floor in a room. Remove all the fabric curtains in a room from their rods and put them in a bag to bring to your dry cleaner. Move furniture off a throw rug or hall runner and take the rug outside. Shake it out and then drape it over something (like a railing) and hit it with a broom handle. Return the rug and replace the furniture. Inspect furniture for damage and wear. Schedule any appointments necessary to have damaged and/or worn items repaired or set aside a block of time to shop for a replacement. Congratulations on your new book, Erin! I look forward to reading it. I asked a lighting expert about LED bulbs. He’s a fan in general, but advised against using them in bedrooms. The blue light they produce has the potential to disrupt sleeping patterns. I got my copy in today’s mail, and I am so excited! 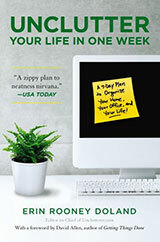 Between your book and the 52-week challenge, I expect my house to start shaping up! Since I’m disabled and can only manage small increments, this is the perfect thing for me. I usually do small things during commercial breaks when I watch tv, and now I have really focused ideas for exact things I can be working on during these micro-bursts of time! @Min — I hope it’s helpful!! an elderly family member and all of your expertise would be welcome. a problem. Best wishes and thanks. and wanted to support you! Your first book inspired me to deal with my clutter once and for all. So much so it enabled me to downsize from a 6 bed house to a 2 bed home. I’m still battling with clutter ( read this excerpt, identified my desk as one area that attracts clutter) and tackling that today. I still have unopened boxes from the move. We open them and end up taking most of the contents to charity. 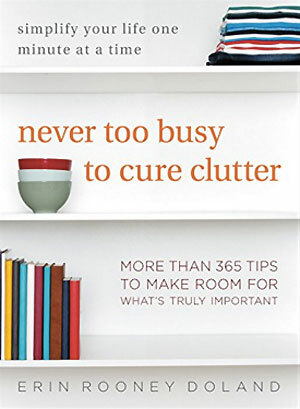 My decluttering inspired others, loaned your book out to numerous friends, as it has such a practical and achieve able approach to dealing with too much stuff. We have a one in, two out rule. Currently my husband is finally tackling his music collection, his decision. Lead by example don’t make others part with their stuff, it causes friction. They will follow. The advice here is excellent. We can get overwhelmed by the enormity of the task, so break it down, got 5 minutes, do one small task and you get a massive sense of achievement it encourages you to continue and you begin to believe that you can do it. You can.